Gee Elvis...you should be in my place at the moment mate...it's after 9pm and it's still 34 deg C.
So Vince, are you also temperature sensitif? But your speed going down when temperature goes up? Yes mate...the older I get, the more high temp sensitive I seem to get. This heat we have here at the moment is sucking every ounce of energy outa my body. Suz, doing a rain dance....yeah, nice mental pic mate. Back to the topic at hand. Increased temperature is supposed to make one more energetic. Back to the original topic :-P Does anyone know what powder was used in the 7.62 NATO round? I fired FN's in temperatures in the -35C range lying prone in the snow and they always went bang and cycled the action. PCl507 Densité 920 g/l Flacon de 500 g et 2 kilos - Sphérique - Cette poudre, bien que mise au point spécialement pour le 7,62 X 51 OTAN est d'une flexibilité qui autorise son emploi du .222 Rem au 9,3x74 en passant le 30/30 et le 30-06 SPFD. Excellente pour les calibres "cylindriques" : 458 Win Mag et 45/70. I'm still using PCl507, but I think production stopped a few years back. It will be very close in burning rate to your 748 Winchester and your BL-C(2) Hodgdon. for your info:.308 Win/7,62x51: 46,0 grs (=2,98 gramme) of PCl 507 behind a 150 grs FMJ would give you about 848 m/s out of a 590 mm long barrel. That would be the original M80 146/7 grain round. I did some more research. Edit: I checked with a friend who was an infantry senior NCO when he retired. He corrected me. The M118 cartridge was used in the rifle and the M80 in the GPMG. The problem is that the ammo we were firing was made by IVI and most likely used another powder so I am no further ahead. Aloy I also found many references to W748 as the original powder but I believe this may be mistaken although the powders appear to be close as is BLC-2. BTW I can usually pick out what text in French means. Google translate is often more funny than effective. Mac, when you know where the FAL was originally made, then you should at least consider PCl507 as the original powder. And in the reloading data they give a load for a 150 grs FMJ, but most FMJ's in .308 you will find here are 146 grs and not 150 grs. The Canadian rifle was made in Canada under license. The powder was most likely sourced from the former Dupont/CIL plant in Vallyfield Quebec. It is now owned by General Dynamics and IMR powders are still made there today. I am guessing IMR 4895 was used in the Canadian rounds made by IVI in Valcartier. As far as I can ascertain, IMR4895 is a single base powder and not formulated or treated for temperature stability. The whole powder industry is a confusing subject in itself. It would make an interesting book. Trying to find out what powder a commercial or military round is more than likely a futile effort. While it is possible they used a "cannister" grade powder, they typically do not. They define a set of requirements that must be met (burning rate, performance in certain temp. ranges, etc) and then buy in huge batches. The powder they use is more often than not something unavailable to reloaders. When that runs out if another powder distributor can meet their specs at a lower price, then the powder changes. There is no guarantee that a container of ammo all has powder from the same lot in it either. I've been in discussions with people who pulled bullets from a single box of factory ammo and found more than one type of powder. I believe one gentleman claimed he saw three different powder types in one box of factory ammo! I think it's best just to find an accurate load, with a powder that has a good rep for being temp. stable and then test it our for yourself in whatever conditions you may find yourself in. Mac, look at/research WC846 !!! Mac, ADI initially developed AR2206 for the Aussie 7.62mm NATO round. Unfortunately this great powder is no longer in production, although they have replaced it with AR2206H. I think, from memory, AR2206H is marketed by Hogdon as H4895. ADI/Thales powder are all single based and designed for a wide temperature range which would make them very stable in all temperatures with the exception of the extremes. Slim, Arguing with a chronograph .....my bet is the chrono is gonna win !!! Well, chambered, The double chrony set-up has worked well and the measured velocities of my ProChrono average within 10 fps of the Oehler Research Chronograph that a buddy loaned me. 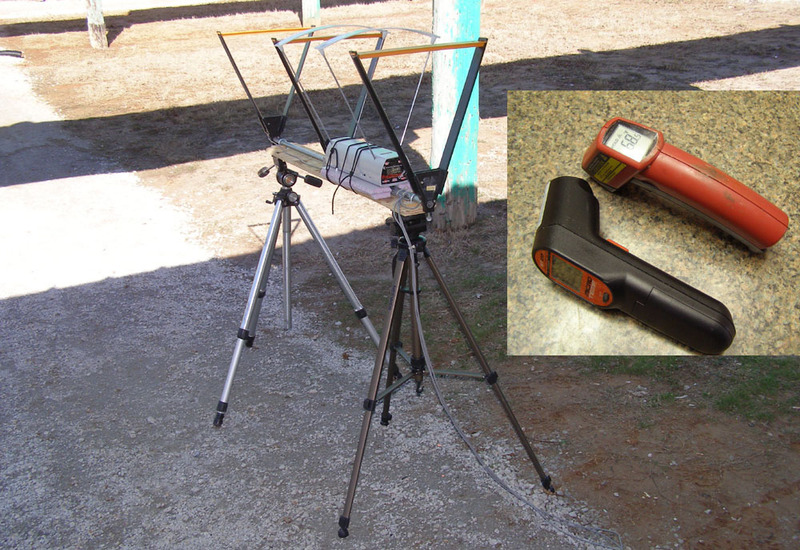 This has been over three ranges sessions, temps between 45 and 70F, and velocities from 1000 to 3700 fps. So, it looks like the chrony is ok. I've also been using IR temp gauges to measure barrel temperature. They have been problematic. One doesn't measure temps accurately that are below 60 F and the other goes into a failure mode if its temperature goes below 65. I have to keep it up on the truck dash with the sun shining on it between readings so it stays warm. I never really showed you gals and guys why I started down this path to determine temperature sensitivity (or was my chrony at fault). 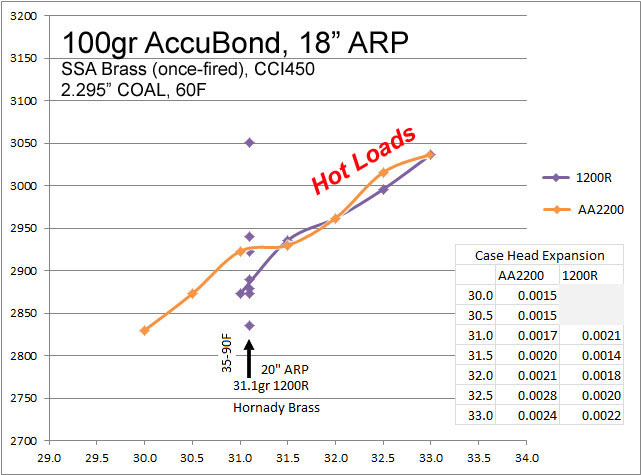 Here are some velocity measurements of a 1200R powder load with 100 Accubonds. I've had a velocity variation of over 200 fps going from summer to fall to the winter season. Thats represented by the vertical spread of purple dimaonds. Note, above 31.5 grains of powder, I believe I was over max chamber pressure. I was testing the limits of the powder and measuring case head expansion. The primier pockets were too loose on those cases and they had to be discarded. Slim, Just heating and cooling the ammo won't give the true story. The firearm being testing needs to be at ambient temperature as well. The bolt face and chamber can warm/cool the brass of the case rather quickly. some testing done on powder temperature where he found barrel temperature is just as important. I tried to test for this barrel heating affect. I did a first series of runs with 10 shots slow-fire at 30-second intervals leaving the next round in the chamber, .223 and 6.8. There was NO rise in velocity at all. Barrel temps rose just slightly but I was measuring temps just in front of the barrel extension which I learned later is not the place to take a measurement. The best place to measure barrel heating is just before the gas block on an AR barrel (no boring graph provided). Next, 10-shot rapid-fire strings were done which warmed the barrel up considerable more. It appeared muzzle velocities might be starting to climb after 7 shots (top 2 graphs). So, a 20-shot string was done with the .223. As you can see, there was no rise in velocity occurred after 20 shots and barrel temperature rose significantly. 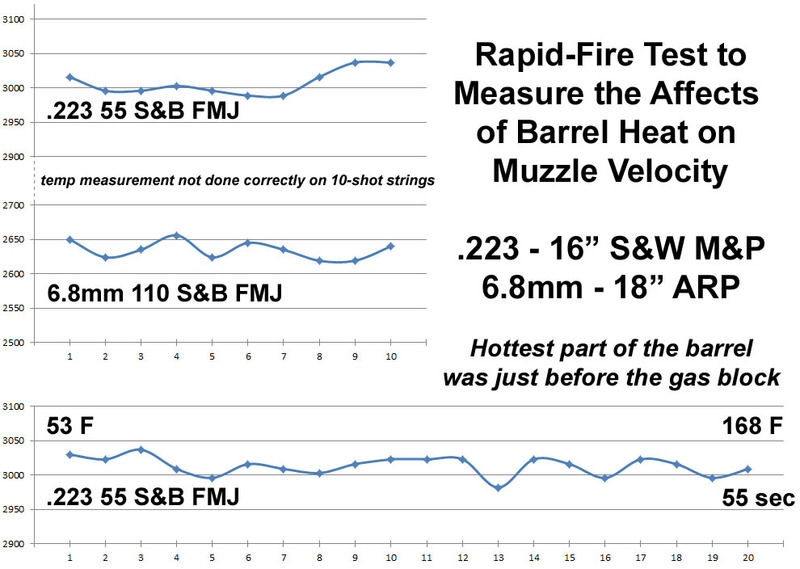 These limited test do not prove muzzle velocities don't rise with barrel temperature rise. S&B could have choosen a powder that was fairly insensitive to temperature. They did validate my ProChrono is reading accurately and that a I should be able to take a couple of shot during the Temperature vs Powder Sensitivity Test without having barrel warm-up significantly and altering the results. This is an interesting subject. It raises some questions in my mind. Do temperatures affect burn rate? If this is the effect, would it be more recognizable in a shorter versus a longer barrel? Do peak pressures have a corelation with temperature? Would a hotter/cooler primer or more/less powder offset the temperature effect and still remain within safe operating range? Would changing powders be a a strategy for adjusting a load to expected tempersture conditions.? It would be nice if we could get our hands on the powder companies test results reference temperature sensitivity. A controlled test where the temperature of the cartridges in say five shop groups is measured just before firing with temperature varied for each group and then the results plotted would reveal the sensitivity curve for that powder.